Although hearing loss can result from aging and certain medical conditions, the main cause of hearing loss for workers is excessive noise in the workplace. When workers are exposed to loud levels of noise over a period of time, they can experience what is called noise-induced hearing loss. Thousands of workers already have noise-induced hearing loss, because many workplaces did not adequately control noise in the past. The situation has improved since workplace noise regulations were passed thirty years ago. Nonetheless, millions of workers are still at risk for hearing loss. It is important to recognize that noise-induced hearing loss is cumulative. This means that exposures to loud levels of noise off the job – gunfire, power tools, and loud music - can also contribute to a worker’s overall hearing loss. How Does Noise Lead to Hearing Loss? Sound waves travel through the ear canal – vibrating the eardrum, which passes the vibration through the middle ear along to the cochlea, the snail-shaped part of the inner ear. The tiny hair cells lining the cochlea bend in response to vibration. This transmits a signal to the brain (see Figure 1). Hearing loss is like a shortcut path on grass. When you first use the path, your feet bend the grass down and it takes a while for the blades to spring up after you pass. The more you walk on the path, the longer it takes for the grass to recover. And what happens if you repeatedly walk on the same shortcut path for days, weeks or years? The grass will eventually wear down. Permanent hearing loss occurs when the hair cells in the cochlea that bend in response to vibration are so damaged they cannot recover, just like the grass that has been trampled over too many times. At first you may experience a temporary loss of hearing from which you recover by the next day when you return to work, but over time the loss of hearing may become permanent. Many people with noise-induced hearing loss complain of gradual deterioration in hearing. A common complaint is difficulty in understanding speech, especially if there is competing background noise. Muffling of certain sounds may also occur as well as tinnitus (a ringing sound in the ear). Hearing is usually tested using an audiometer. This device generates sound tones at different frequencies (measured in Hertz). Typically you sit in a booth or closed room and are asked to listen to a tone at a particular frequency at varying decibel levels. The procedure is repeated at several different frequencies. The decibel level at which you first hear a particular frequency is plotted on a graph called an audiogram. The right ear and left ear are charted separately. The louder the volume has to be turned up for you to hear a particular tone, the more hearing loss there is in that test frequency. An example of an audiogram is shown below (see Figure 2). The further the line is below “0,” the greater the impairment. A hearing loss of 25 dB or more is normally considered hearing impairment. Can a Doctor Tell Whether My Hearing Loss is from Noise Rather than Aging? When hearing loss has occurred because of exposure to noise, the audiogram will show that the individual has lost the most hearing at the 4,000-Hertz frequency. This hearing loss will appear as a notch, or dip, in the audiogram at 4,000 Hertz frequency, as shown on the graph below. In addition to your occupational and personal history, this is how the doctor can determine from the audiogram that your hearing loss is related to noise. If I Already Have Hearing Loss, What Should I Do? Once you experience hearing loss, you need to protect yourself from further damage to your hearing. The more you are exposed to hazardous levels of noise, the more hearing loss you are likely to experience. To prevent further damage, you should take steps to reduce your noise exposures both on and off the job. Start by talking to your employer and local union about evaluating the noise levels at work. 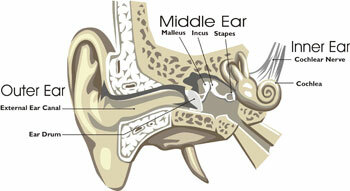 Remember, once hearing loss occurs, it is permanent and irreversible. All states do consider work-related hearing problems compensable diseases under their workers’ compensation laws. You may be able to get payment for medical treatment including medical devices such as hearing aids as well as reimbursement for travel costs for medical evaluation and care. You may also be able to get a lump sum payment for permanent hearing loss, equal to a certain number of weeks of pay called a Schedule Loss Award. Check with your WHPP Local Coordinator for the specifics of the state you live in.